Margaret Atwood‘s novel, The Handmaid’s Tale, is beautifully written. From the first paragraph describing the gymnasium where the handmaids-in-training sleep, I was deeply immersed in the world being brought to life by the narrator, Offred. The novel consists of Offred’s poetic descriptions of her life as a handmaid to The Commander, a high ranking official in the Republic of Gilead, as well as flashbacks to her life as a student, wife, and mother, before her time as a handmaid. After the President of the United States and much of Congress are killed in a terrorist attack falsely blamed on Islamic extremists, the “Sons of Jacob” build a new society, the Republic of Gilead. Birth rates have been declining due to sterility caused by extreme pollution and STDs, and so women have all of their rights taken away. 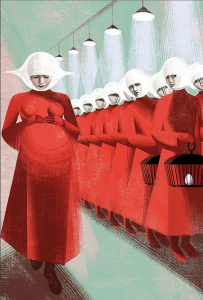 Fertile women are trained as handmaids for the elite of Gilead, forced to participate in “The Ceremony” every month with their Commander and his Wife, hoping that the handmaid will become pregnant and help the population to grow again. 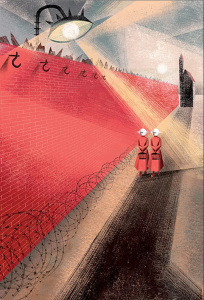 No women are allowed to read, except for Aunts, the women in charge of training the handmaids and keeping the women in Gilead under control. As a twenty-something woman today, this book was a bit terrifying. There are many people nowadays who want women’s bodies to be controlled by the government. With ISIS having such a noticeable presence overseas, if someone wanted to blame an attack on them, it certainly wouldn’t take much to convince the citizens of our country. 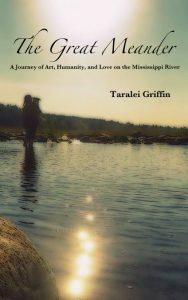 Although it was eerie with how similar the pre-Gilead USA is to our current world, I still thoroughly enjoyed this book. The descriptions of Offred’s life before were striking and full of longing. The smallest details of life in the Commander’s house – such as a single embroidered pillow, or a Latin phrase carved discreetly into a floorboard – were depicted as something amazing, because there was so little in life to enjoy as a handmaid. Everything was red, the color of the handmaids’ dresses, yet bland. Offred forced herself to remember and allowed herself to hope, as those feelings were all she had for herself anymore. She began to find that she still had power, being one of the women left in society with the ability to become pregnant. But it was small compared to the way the world around her had become. What I need is perspective. The illusion of depth, created by a frame, the arrangement of shapes on a flat surface. Perspective is necessary. Otherwise there are only two dimensions. Otherwise you live with your face squashed up against a wall, everything a huge foreground, of details, close-ups, hairs, the weave of the bedsheet, the molecules of the face. Your own skin like a map, a diagram of futility, criscrossed with tiny roads that lead nowhere. Otherwise you live in the moment. Which is not where I want to be. 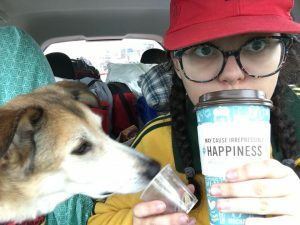 At the end of the novel, I wanted more knowledge about Offred – both of who she was prior to her life as a handmaid, and what was to be her future. But Margaret Atwood gives you enough information and inspiration as the reader to fill in whatever you might want or need to know on your own. 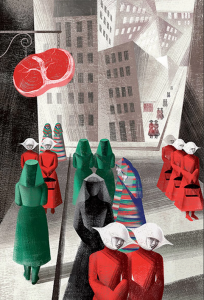 All illustrations in this article were taken from The Guardian’s article on the 2012 Folio Society edition of The Handmaid’s Tale. The next book on my Before 25 Bucket List that I am currently reading is Speak by Laurie Halse Andersen. Keep your eye out for my final review!